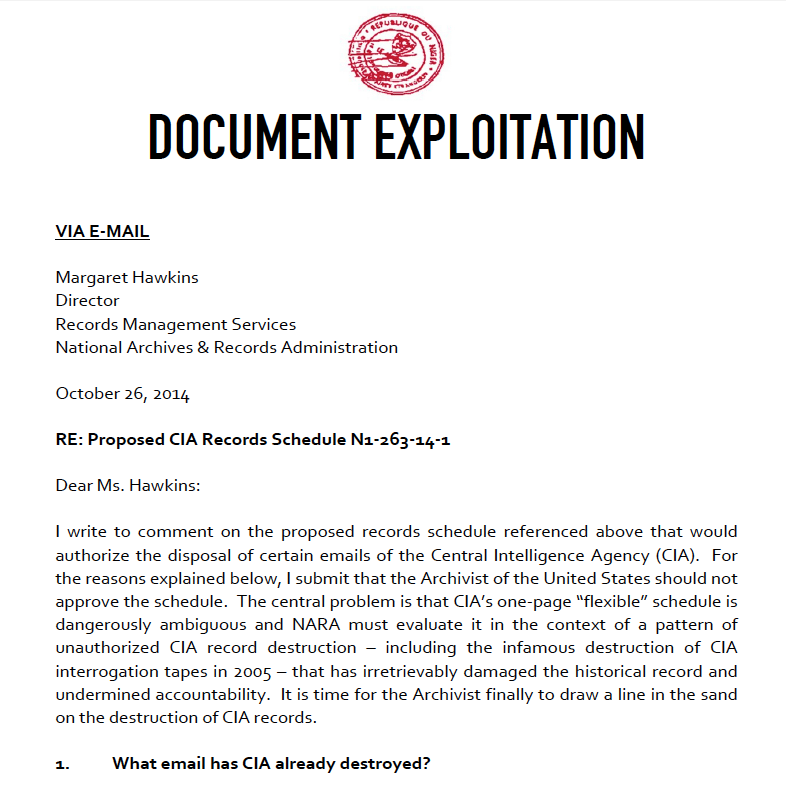 Document Exploitation: CIA Cannot Be Trusted to Destroy "Non-Senior Email"
CIA Cannot Be Trusted to Destroy "Non-Senior Email"
On September 17, 2014, the National Archives and Records Administration (NARA) published in the Federal Register a Notice of a new proposed records schedule (N1-263-14-1) from the Central Intelligence Agency (CIA) that would make certain "Non-Senior Email" temporary and ultimately disposable. The "full" proposed schedule - which effectively is only one-page long - is here and NARA's appraisal of the proposed schedule here. I have submitted a comment to NARA on the proposed schedule that argues that the Archivist of the United States should not approve this schedule. The main thrust of my comment is (1) the proposed schedule is dangerously ambiguous, (2) it rests on suspect assumptions, and (3) CIA simply cannot be trusted with the extremely broad discretion to destroy records that this ambiguous schedule provides - for reasons I have previously documented here, here, here, here, here, here, and here. The full text of my comment is posted here. Earlier coverage of the proposed schedule by Steven Aftergood at Secrecy News is here.